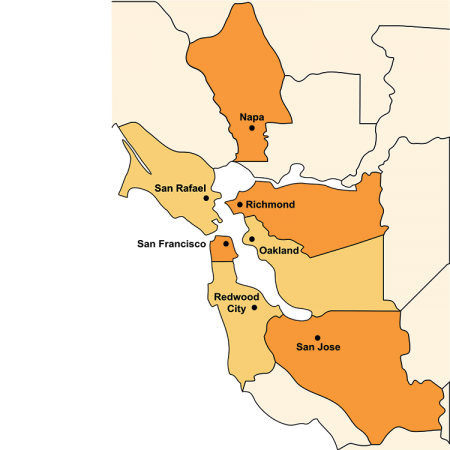 The Legal Barriers to Employment Project (LBEP) is a unique, free legal aid program of Bay Area Legal Aid (BayLegal). LBEP assists San Francisco residents receiving Personal Assisted Employment Services (PAES) and welfare benefits for families and single adults (CalWORKs). Through LBEP, BayLegal staff addresses the legal problems that interfere with our clients’ ability to obtain or retain employment. Although CalWORKs and PAES recipients involved in welfare-to-work activities want to become economically independent, many of them find their employment efforts frustrated by legal problems such as the need for a restraining order against a batterer, a housing eviction proceeding, a suspended driver’s license, or the need to expunge a criminal record. LBEP advocates address such legal problems. LBEP staff offer a holistic legal approach to client representation. While clients initially call for help on a single, specific legal problem, project advocates often learn of other, sometimes more serious, legal problems after interviewing the client. LBEP staff provided services in eight languages to over 850 clients with nearly 950 different legal problems from January 2000 through December 2006. Clients sometimes contact BayLegal directly, but more often they are referred by staff at the San Francisco Department of Human Services (SFDHS), the One-Stop Career Centers, job training sites or community-based organizations. LBEP has been funded with Temporary Assistance for Needy Families (TANF) Formula funds, State CalWORKs funds, and San Francisco County general funds. Until July 2004, LBEP’s contract was with the Workforce Investment Board of San Francisco and the Private Industry Council. As of July 2004, the San Francisco Department of Human Services became the grantor. Cindy Sherwood contacted LBEP because, after being offered a job, a standard criminal history record check was done by the prospective employer and she was shocked to learn that there was a bench warrant out for her arrest. The employer said that Ms. Sherwood could not be hired until she cleared the warrant from her record. The warrant had been issued because the client failed to pay a traffic ticket and failed to appear in traffic court. LBEP advocates advised her to schedule a court appearance as soon as possible. Unfortunately, the court calendar was normally set almost six weeks in advance and the employer was not willing to wait that long to fill the position. BayLegal attorneys first sent a letter to the employer explaining that the bench warrant was a standard practice for certain traffic violations and assured the employer that, as soon as the client appeared in court, the warrant would be automatically lifted. LBEP staff urged the client to go directly to her assigned Traffic Court department and ask the court clerk to put her on the calendar at an earlier date. The client did so and the clerk placed her on the calendar for 9 a.m. the next day. At her appearance, the bench warrant was immediately lifted and she worked out a payment plan with the judge. The position she had applied for was still open and she was able to obtain the job. Betty Mall and her child had severe asthma and allergies due to dust mites and mold. They relocated from their Section 8 housing in San Francisco to Sacramento because the San Francisco Housing Authority (SFHA) planned to renovate their apartment complex. However, the housing in Sacramento aggravated Ms. Mall’s asthma and they had to move back to San Francisco. Ms. Mall told the SFHA that they could not move into the unit offered because its carpet would worsen their asthma. SFHA told her that she would lose her Section 8 housing if she refused so Ms. Mall reluctantly agreed. After moving in, she and her daughter began having severe asthma attacks. LBEP staff helped her draft a reasonable accommodation request. SFHA agreed to remove the carpet and replaced it with vinyl flooring. Ms. Mall and her daughter were then able to breathe much more comfortably. Karina Alcalan, a single mother on CalWORKs, had trouble finding new, affordable housing because of bad credit. Her credit report reflected a debt of $3300 with a major credit card company. She claimed that she was not liable and asked that her name be taken off the account since her husband had accrued these debts after their divorce. However, the credit card company refused to remove her name because the balance was so large. An LBEP advocate faxed a letter to the credit card company’s Consumer Dispute Verification Department, demanding that it remove Ms. Alcalan’s name from the account, relieve her of any liability for her ex-husband’s debt and ensure that the three major credit reporting agencies erase any negative credit points. The credit card company finally agreed that Ms. Alcalan was not liable for the debt, removed her name from the account and instructed the three major credit reporting agencies to remove the negative credit caused by this situation.